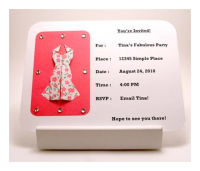 We'll be hosting some great invitation and cardmaking competitions, not to mention giveaways, on an on-going basis. Join in and submit your crafty creations to win great prizes! Subscribe to the DIYI Ezine Newsletter or keep up to date with our Blog to be the first to hear about our contest and giveaway announcements. Stay Tuned For Our Next Contest Or Giveaway! Our Big Handmade and DIY Wedding Invitations Contest has just come to an end! We sent out the call for our brides and brides-to-be to send in their handmade and semi-handmade invitation tutorials to enter to win one of our fantastic Etsy.com prizes. The entries were quite fabulous and super creative. Good job ladies and thank so much for participating! I also want to extend a big Thank You to our lovely panel of expert judges who came on board to determine the winners of this competition. Our Judges? Meet Jessica Bishop of Thebudgetsavvybride.com, Kym Stelmachers of BecomingTheMrs.com, Lauren Donaldson of LaurenEliseCrafted. Thanks so much for participating ladies! I asked each of our judges to give the best entries a score from 1-10 based on overall style, creativity, and originality. Those scores were then tallied up to determine our winners based on highest scores overall. Congratulations Ladies! I'll be contacting each of you to claim your prizes. 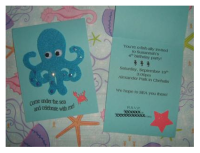 As a bonus to the big competition we also held a random drawing giveaway amongst all of our contestants, to win a custom designed printable invitation map, courtesy of Do-it-yourself-invitations.com! All of the entries to the giveaway were assigned a number. We picked our giveaway winner's number using Random.org. #9 Amber from Calgary, Alberta, Canada. 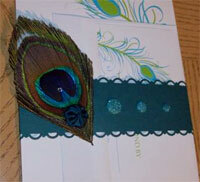 Amber also entered her Sparkle Peacock Wedding Invitations into our competition. Congrats Amber! Congrats to Tina from Maryland! You won! Congrats to Megan from Washington! You won! Got an idea for an upcoming contest? Let us know what kind of contest you'd like to enter!